Jaipur is the capital of Rajasthan and is known as the 'Pink City' since its buildings were painted for the visit of the Prince of Wales in 1876. Jaipur was designed as a planned city, though today it exhibits the colourful chaos and bustle of many Indian cities, with streets packed with pedestrians, bicycles, cars, buses, camels and cows. Inside its old city walls, the City Palace now contains a museum for royal garments, miniatures, carpets, manuscripts and armour. The 18th century observatory of the astronomer Jai Singh, known as Jantar Mantar, contains a series of immense astronomical instruments made of marble and brass that is now a UNESCO World Heritage Site. Elsewhere the pink sandstone facade of the Palace of the Winds (Hawa Mahal) is a famous Jaipur landmark. 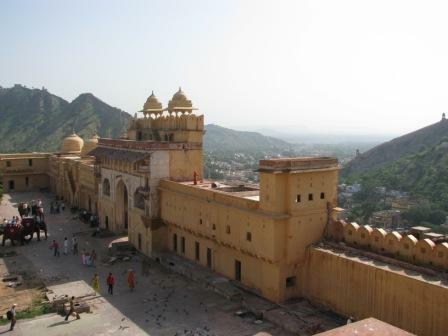 11km north of Jaipur lies the spectacular Amber Fort, a hillside complex containing many courtyards and fine decorated palaces, halls, gardens and temples. The massive gateway can be reached by riding an elephant into the fort. Known variously as 'The Pearl of Rajasthan', the 'City of Sunrise' or 'Venice of the East', Udaipur is widely regarded as Rajasthan's most beautiful city and one of the most romantic in India. The city is set around the vast Lake Pichola and is renowned for its sumptuous palaces and the atmospheric narrow lanes of its Old City. On the east shore of the lake lies the spectacular City Palace, founded in the 16th century which is now both a museum and still the residence of the Maharaja. The views from the palace across the lake are stunning, including the two island palaces - Jag Mandir and Jag Nivas, the latter now being the luxurious Lake Palace Hotel. The Jagdish Temple was built in 1651 by Maharana Jagat Singh I and contains a huge black stone image of Jagannath, an aspect of Lord Vishnu. The whitewashed buildings and bazaars of the Old City are perfect for exploration in search of souvenirs like tie and dye fabrics and miniature paintings. 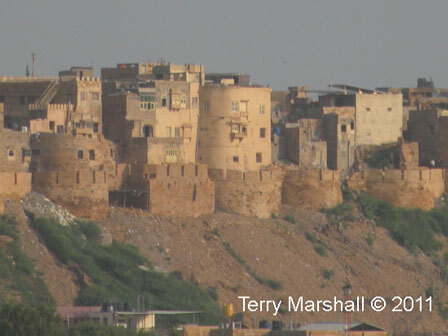 At the edge of the Thar desert lies Jodhpur, Rajasthan's second largest city. 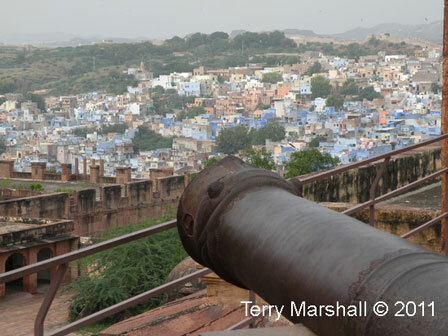 Jodhpur is known as the Blue City due to the large number of pale indigo painted houses in the Old City, which signify that they are the home of Jodhpuri Brahmins, the high caste Hindus. Founded in 1459 by the Rajput chief Rao Jodha, Jodhpur is dominated by the magnificent Meherangarh Fort, which sits on steep escarpment overlooking the city, with magnificent views of Jodhpur and the surrounding desert. Inside the walls and gateways of the Fort lie many palatial buildings and courtyards of classic Mughal style, once home to the Jodhpuri Maharajas but which now house one of Rajasthan's best museums. Elsewhere in the Old City, the narrow alleys around the famous Clock Tower are very atmospheric and renowned for their bazaars selling textiles, silver and handicrafts while the immense 16th century wall which still surrounds the city is almost 10km long. Jaisalmer is one of the jewels of Rajasthan, a medieval walled city that is perched on a sand-coloured rocky hill in the middle of the Thar desert. Founded by Rawal Jaisal in 1156, Jaisalmer became a major trading post on the southern Silk Road routes from Central Asia. Merchants grew wealthy from the passing camel caravans and built many beautifully carved wooden and sandstone havelis which are still present in the city today, including the Patwon Ki and Salim Singh Ki Havelis. The narrow cobbled lanes of the old city also numerous packed Jain temples, forts and palaces built from sandstone, giving Jaisalmer a wonderful medieval atmosphere and earning it the name 'The Golden City'. The thick city walls are over 10 metres high and include 99 bastions, while the fort contains the palace of the Maharawal. Organised group tours: Click here to see 11 tours to Rajasthan which may include Desert Cities of Rajasthan.